You might have heard over the weekend that skyrocketing gas prices have finally "plateaued." 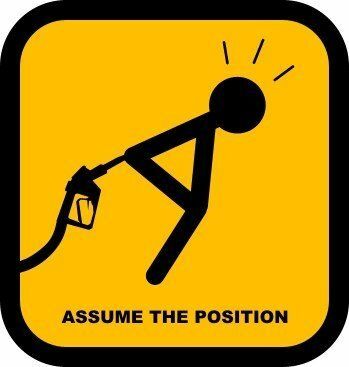 If gas prices were like gravity, you would anticipate they would start plummeting soon. Raise your hand if you expect that. Me neither. While the words "skyrocketing" and "gas prices" often end up in the same sentence, "plummeting" and “gas prices” rarely occupy even the same paragraph. In a perfect free market, prices should float up and down with equal speed. But in our market, what goes up doesn't seem to come down, at least not at once. What gives? We've been told for months that instability in the Middle East spooked the traders who set gas prices, which are almost $1 per gallon more at the pump than a year ago. Prices jumped 30 cents from mid-March to mid-April alone, to an average $3.88 a gallon. What are odds, do you think, that average prices will return to $3.58 by mid-May? 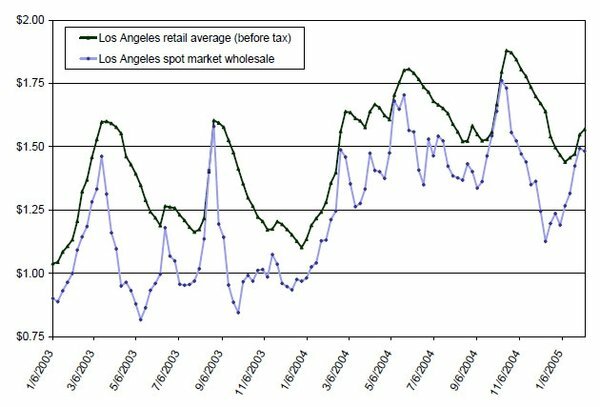 The quick rise/slow fall phenomenon will feel familiar to most consumers, who often explain it with this conventional wisdom -- greedy retailers take advantage of temporarily high prices as long as they can to sock away a little extra profit. Economists tend to scoff at conventional consumer wisdom, but basic economic theory holds no explanation for the sharp rise/slow fall price pattern. Twelve years ago, economist Sam Peltzman -- a free market advocate not known for consumer-friendly research -- conducted a vast study of price "shocks," which could have dispelled these complaints as yet another whiny consumer myth. Instead, it fueled the fire. His review of 77 consumer goods that had been subject to abrupt price increases – including gas -- led Peltzman to write a paper called simply "Prices rise faster than they fall." "The title summarizes the main result: the person in the street is right and we are wrong," Peltzman wrote. (PDF) In fact, the results were so vexing he called it “a serious gap in a fundamental area of economic theory." Consumers might call it price gouging; economists like Peltzman have settled on a more neutral term: "asymmetric price adjustment." And while economists have conceded this time that whiny consumers happened to be right, they aren't yet ready to sign up for their conspiracy theories. For economists interested in the more general problem of pricing, gas prices are a fantastic real-world laboratory. Nearly all consumers need gas. Prices fluctuate often, and there is (theoretically) widespread competition, making gas stations a nearly ideal marketplace to study. And nowadays, thanks to services like GasBuddy.com, it's relatively easy to gather price data across wide geographic regions. The first research into what some called gas price “stickiness” was published in 1997 by a research team headed by Severin Borenstein, who found that gas prices fall about twice as slowly as they rise after a price shock. For example, if prices rise 50 cents in four weeks, and the cause of the increase is eliminated, it’ll take about eight weeks for the prices to return to pre-shock levels. Matt Lewis, an economist at Ohio State University, has been studying gas prices for more than a decade. He's considered some of the usual allegations, like pricing fixing and collusion among stations. He doesn't entirely discount those, but he thinks he's found a better explanation for the fast rise/slow fall phenomenon. Here's his theory in a nutshell: When prices fall, consumers are so relieved that they stop shopping around for the best price. That eliminates the normal downward pressure on gas prices and allows stations to squeeze out a few more cents of profit while prices slowly fall. 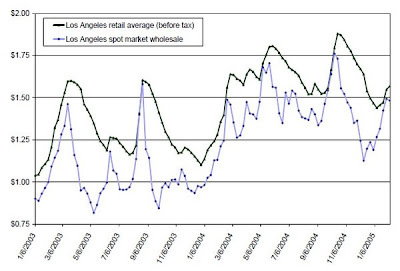 One chart from Lewis' research, showing the inexact relationship between wholesale and retail gas prices during 2003-2005 in the Los Angeles market. Notice the soft, rounded peaks on retail prices, as opposed to the sharp peaks on wholesale prices, showing that prices don't go down as quickly as they could. Also notice that stations' profit margins often shrink as prices rise. "Consumers shop around more intensely when prices are going up. When they are falling, they don't shop around as much," Lewis said. A key element of his theory is something economists call a "reference price." Your local car salesman might know it as "framing." Once consumers get a number in their head -- $10,000 for that car, $3.70 for that gallon of gas -- all subsequent choices are impacted by a new price's relation to that reference price. When the car dealer says, "OK, $9,500," you think you have a good deal. When the nearest gas station drops the price to $3.63, the average consumer impulsively stops searching. "If prices are falling, you pull into a station and think 'I have a good deal,'" Lewis said. The last big gas price shock -- the speculation price bubble of 2008 -- created a perfect opportunity for Lewis to test his theory. Consumers can use GasBuddy.com to search for the lowest gas price in their area. As prices soared in the first half of 2008, Lewis charted a similar spike in GasBuddy.com traffic. When prices fell that fall, GasBuddy.com Web traffic fell, too -- showing gas shoppers became less interested in shopping around while gas prices waned. Lewis' more recent research has added another nuance to his theory that might make consumer conspiracy theorists feel a bit better. Lewis has, for years, observed several Midwestern retail gas markets that don't behave like other U.S. markets. Intense competition in some small towns near his Columbus, Ohio, home has led to regular cyclical price wars. Stations undercut each other on a daily basis, engaging in short-term price wars that might drop prices from $2.50 to $2.38, for example. But after a few weeks, one station will bite the bullet and raise prices back to $2.50. Other stations follow suit. Then, the cycle begins again. In these areas of cyclical price wars, Lewis has found that the fast rise/slow fall phenomenon doesn't apply. In other words, stations facing intense competition can't get away with what consumers might call "gouging" and economists call asymmetric price adjustment. Lewis isn't ready to generalize those observations just yet, but conventional wisdom will tell you there's not enough real competition in gas prices. Twelve years ago, Pelzman predicted imperfect competition would be blamed for the sharp rise/slow fall price pattern. He dismissed that explanation as "unlikely to be rewarding." Making the issue even murkier, behavioral economists will tell you, is the fact that gas shoppers are anything but rational agents who constantly seek out the best price. Instead, many are pesky realists for whom the nearest station will do. On the other hand, some consumers overestimate the true value of a cheaper gallon of gas, because they underestimate the cost of driving to get that cheaper gas (what economists call "search costs”). In "The Cheapest Gas in Your Area Can Cost More," Loyola College Professor Joseph Ganem makes the argument succinctly. "If you drive five miles out-of-the-way to purchase gas in a car that gets 25 miles per gallon, that 10-mile round trip burned 0.4 gallons. If you drove that distance to pay $2.95 per gallon to fill a 12-gallon tank, instead of paying $3.00 at your local pump, you actually spent almost a nickel more per gallon for your tank of gas," writes Ganem, author of “The Two-Headed Quarter: How to See Through Deceptive Numbers and Save Money." He has a nifty "Is it worth it" calculator on his Web site. It should also be noted that while retail gas prices – in fact, all commodity prices -- remain artificially high temporarily, retailers can’t get away with exorbitant overcharges for long. Gas price history bears this out. Still, Lewis' theory has implications far beyond the gas market. If there is a general lack of price sensitivity when prices fall, basic supply and demand just took another body blow, and comparison shopping just isn't what we thought it was. The lesson for consumers is clear: As gas prices fall during the next few months, don't abandon the good price shopping habits you've acquired. While consumers tend to be hyper-vigilant while the price of gas is soaring, the real rip-offs will occur when it’s declining – when you’re likely to have stopped paying attention.